Hotel Information, Check-in and Arrival Details. St George's Pimlico is located on St Georges Drive, Pimlico. In a residential area just 5 minutes from Pimlico underground station, 15 minutes walk from Victoria Railway and Underground station including the Gatwick Express or 10 minutes from Victoria Coach Station. St George's Pimlico has two properties, 107 and 115 St Georges Drive. Please note reception is at 115 St Georges Drive. Please press the button on the intercom to gain access. Reception is on the left as you enter. The Duty Manager will check you in and be on hand to help with any questions, directions, advice or helping you to plan your visit. Please feel free to ask if you need help with taxis or where to go and what to do. Check in time is 15:00 hrs and we will always try to have your room ready for your arrival. You are welcome to check in anytime, but if your room is not ready before 15:00 hrs then we can store your luggage for you. Check out time is 11:00 hrs and late check outs are £40 per room up to 14:00 hrs. (subject to availability). Guests arriving after 23:00 should Email us for key code to hotel. Delayed flight arrivals please press bell at Hotel. 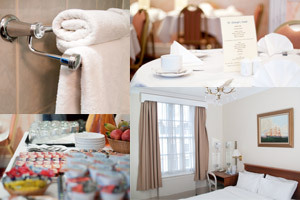 Before reserving your room take a look at our image gallery and see for yourself why St George's Pimlico has become a very popular choice for tourists and many local businesses..